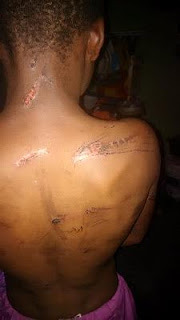 A Good Samaritan, identified as Micheal Adesokan has sought the help of the Lagos State Government, for a victim that has been allegedly abused by his guardian. He shared some disturbing photos on his twitter timeline @michealadex, showing the young boy’s body. According to his tweets, the boy lives on Olorunishola Street, Oshodi. Although he did not disclose her identity, the guardian is said to be a school teacher in Lagos. He, therefore, called on the government and agencies to intervene on behalf of the young boy before matters get worse.